← Love fish? Help keep them around. First wash and chop up the tomatoes, cucumbers, sweet red pepper, and green onion and mix together in a large bowl. Chop up the dill and mix it into the salad so it’s evenly distributed. If you’re adding the feta cheese, chop it up into cubes and add it to the salad. In a small bowl, mix together the olive oil and lemon juice (or vinegar). If you would like a touch of sweetness to your dressing, add the optional honey to the dressing and mix it in well with either a small whisk or a fork. Mix the salt and pepper into the dressing, and drizzle the dressing over your salad. There you have it – my version of spring in a bowl. Quick, simple, easy, and delicious. 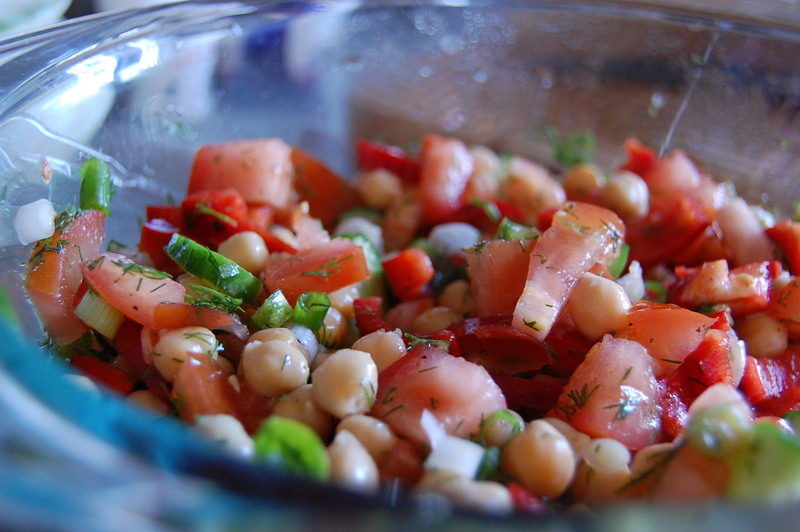 This entry was posted in Salads, Sides, Starters, Vegetarian and tagged chickpea, dill, salad, spring, tomato. Bookmark the permalink. Mmmmmmm… it does feel like spring!! !